KEAM Rank List 2018: CEE (Commissioner of Entrance Examination), Kerala has conducted the KEAM (Kerala Engineering, Agriculture and Medical) state level entrance exam recently on 23rd & 24th of April 2018 for various groups such as Medical, Engineering and Agriculture courses admission. KEAM is also known as CEE Kerala Exam. For the KEAM 2018, lakhs of candidates from the Kerala state and other states has applied for the KEAM 2018 and appeared in the exam on the respective date at various examination centers that are set throughout the Kerala as well as in other test centers. Now all those candidates who have completed writing the KEAM 2018 are eagerly waiting for the exam results. Now the wait is over the CEE Kerala has declared the KEAM Result 2018 on 22nd May and it is going to announce the KEAM Rank list on 20th June. After the release of the results, they will be made available in the official website of the CEE as given below and the candidates can access their respective KEAM Results 2018 from that website online, cee.kerala.gov.in. Know more about the KEAM Results such as the Rank list, qualifying marks etc, from the below given information. Every year, KEAM test will be conducted by the CEE (Commissioner of Entrance Examination) for the eligible candidates for giving admission in to various Under Graduation courses or programs such as MBBS, BDS, BHMS,BAMS, BSMS, B.Sc (Forestry), B.Sc (honors) agriculture, B.FSc, B.VSc (animal Husbandry) and B.Tech (in all branches) in the tops colleges or the institutions of the Kerala state based on the merit or the rank they obtained in the exam and with the qualifying standards that are set by the CEE Kerala. In the same way for the year 2018, the CEE Kerala has commenced the KEAM 2018. This year a massive number of aspirants have attempted the KEAM examination seeking admission into various UG courses. Lakhs of aspirants from Kerala and other states have competed for Kerala Engineering and Medicine test. All the hopefuls those are anxious to check the KEAM Result can check the CEE Official website, cee-kerala.org to check the KEAM result, rank, and score. CEE Kerala is going to prepare the KEAM rank list in 50:50 ratios. That is 50% weightage will be given to the scores obtained in entrance examination and remaining 50% to the qualifying examination (Physics, Chemistry and Mathematics put together). The rank list will be prepared separately for all the courses such as Engineering, Architecture, Medical & Allied Courses and BAMS Courses. The Rank List(s) will be published by the CEE and it should not be utilized by any person authority/ / institution other than CEE for giving the admission in to any of the Professional Courses, without former written permission of the Kerala Government. In order to qualify in the Entrance exam and become eligible for figuring in the rank list for Engineering / Ayurveda / Medical, the candidates need to score a minimum of 10 marks each in both Paper-I as well as Paper-II of the exam. The candidates who have not scored the qualifying marks will not be listed in the rank list. But for SC/ST candidates there are no minimum marks in the KEAM Examination except for the courses MBBS / BDS. But those candidates who fail in answering at least one question in each of those papers are said to be disqualified. For qualified candidates the CEE will conduct couseling for admission into various courses. The KEAM counselling will be done on Centralized Allotment Process (CAP). As per that the seat allotment for aspirants will be done on the basis of their rank list. Initially, the students will be called for counselling in chronological order. After that the admission will be allotted on the basis of their rank, availability of seats, and various other factors. Students those have cleared the examination with qualifying marks will get admission in various courses in Kerala state. Soon the CEE is going to announce the counselling dates for admission of qualified candidates. Hopefuls can keep visiting the CEE Official website on regular basis to know the up to date information. How to Check the KEAM Results 2018? 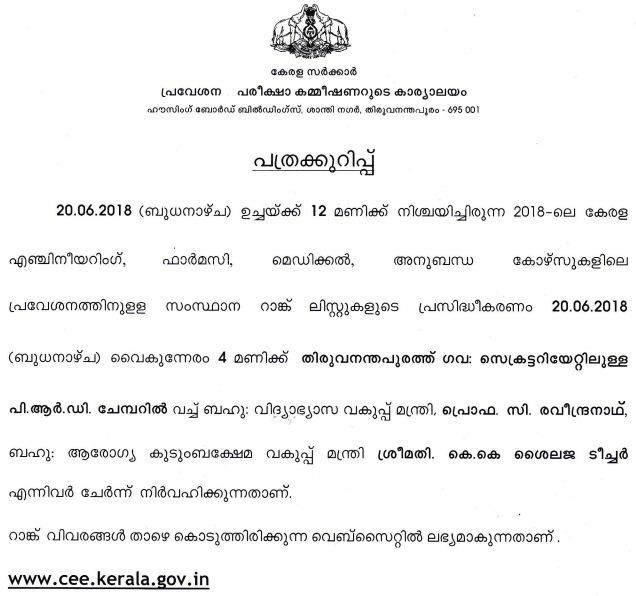 Candidates those who have attempted the exam are advised to go to the official website of the CEE, cee-kerala.org or click on that will be provided below. Search for the “KEAM Results 2018” and then click on that available tab. Now, you can give your Exam registration number, date of birth, and other details as necessary and click on submit button .